Tad later than usual because I haven’t had internet for the past 3 days, and just got it back a few hours ago. 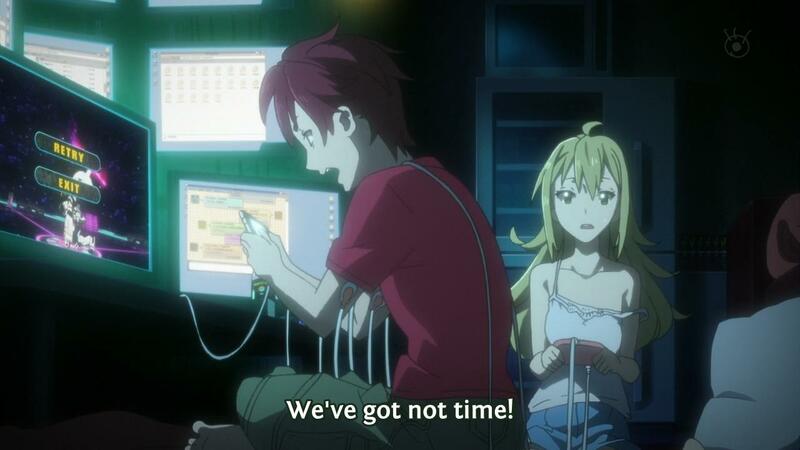 This entry was posted in Releases, Uncategorized and tagged DELAYS, hurf, Robotics;Notes. Bookmark the permalink. Thanks folks, and no worries about the delay. Life happens. Thanks and don’t worry about delays just glad its out today. I’m so glad she didn’t kill herself! Thanks so much for the episode and glad you got your internet back! Did the U-Verse network outage hit you too? Got me, though only for about 27 hours. Anyway, thanks for the release! Uh, no. Someone moved out and canceled the internet, since it was in their name. And no one else took the bill, so when I moved back in, there was no internet still. My waifu. Dat face. 10/10. It’s American English. Don’t they all talk like that? No… It’s a typo. I’d already caught it though. Batch scripts man, batch scripts. Just face it, you guys talk like that. Well, the editor is British. Just saiyan. It’s still a typo though.